Once you have entered details on the Configuration screen of the CSV Importer, the 'File Mappings' screen allows you to match the CSV fields to the User and Group fields in Crowd. 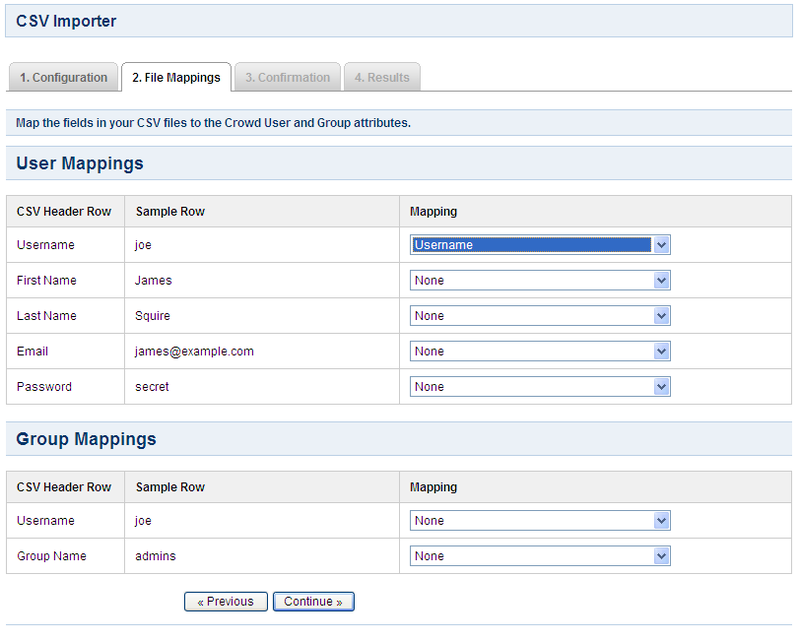 Crowd will use these mappings to import the information from the CSV file(s) into your Crowd directory. Refer to information on preparing your CSV files. 'User Mappings' — Use this section to map the fields in your 'User' CSV file. 'Group Mappings' — Use this section to map the fields in your 'Group Membership' CSV file, if you have one. This section will only appear if you have specified a 'Group Membership File' on the Configuration screen. This column shows the text from each field in the first row of your CSV file. The CSV Importer assumes that the first row is a header row. This column shows the text from each field in the second row of your CSV file. This is done to help you with the mapping process. Each row in this column contains a drop-down list of the Crowd field names available for mapping. To map a Crowd field to a CSV field, select the appropriate Crowd field name from the drop-down list to match the CSV field shown in the 'CSV Header Row' column. Required. One of the rows on the screen must map this value to the CSV field containing the users' first names. Required. One of the rows on the screen must map this value to the CSV field containing the users' last names. Required. One of the rows on the screen must map this value to the CSV field containing the users' email addresses. Required. One of the rows on the screen must map this value to the CSV field containing the usernames. If your CSV file contains passwords, map this value to the CSV field containing the passwords. Select 'None' if the CSV field displayed under 'CSV Header Row' is not to be mapped to any Crowd fields. These CSV fields will not be imported into Crowd. Required. One of the rows on the screen must map this value to the CSV field containing the names of the groups. Complete the details on the 'Configuration screen' and click the 'Continue' button. In the 'CSV Header Row' column, find the field which contains your users' first names — select 'First Name' from the drop-down list in the 'Mapping' column. In the 'CSV Header Row' column, find the field which contains your users' last names — select 'Last Name' from the drop-down list in the 'Mapping' column. In the 'CSV Header Row' column, find the field which contains your users' email addresses — select 'Email Address' from the drop-down list in the 'Mapping' column. In the 'CSV Header Row' column, find the field which contains the usernames — select 'Username' from the drop-down list in the 'Mapping' column. In the 'CSV Header Row' column, find the field which contains your users' passwords — select 'Password' from the drop-down list in the 'Mapping' column. Select 'None' from the drop-down lists for all unmatched rows. In the 'CSV Header Row' column, find the field which contains the group names — select 'Group Name' from the drop-down list in the 'Mapping' column. Click the 'Continue' button to confirm the CSV configuration.